If you ran one of the most successful e-commerce shops in Singapore, the last thing on your mind might be to open a brick and mortar store. But that’s what Love, Bonito has done. And Dione Song, Chief Commercial Officer, reveals to us that the store is working out very well for them. Despite the rise of e-commerce, retail sales in Singapore for apparel and footwear have risen. The latest data from the Singapore Department of Statistics shows that sales increased by 5% year-on-year in March. Meeting Song is like being drawn into a spinning vortex, albeit a friendly one. She spoke rapidly for the length of our interview without seeming to tire, jumping effortlessly from one topic to the next. Her energy apparently extends into the wee hours, as the self-confessed workaholic professes she zaps off emails at 3 AM. Song joined Love, Bonito as its first C-suite hire in May 2018, after years spent in Sephora and Zalora. As Love, Bonito’s Chief Commercial Officer, Song spends her days overseeing a mishmash of teams, from operations to marketing to technology. Why the Love, Bonito flagship store? What makes the flagship store successful? Song thinks there are a few reasons why the flagship store works. For one, the assortment is slightly different from the Love, Bonito online store, and there are constant launches. For another, the store gives people a reason to go back. 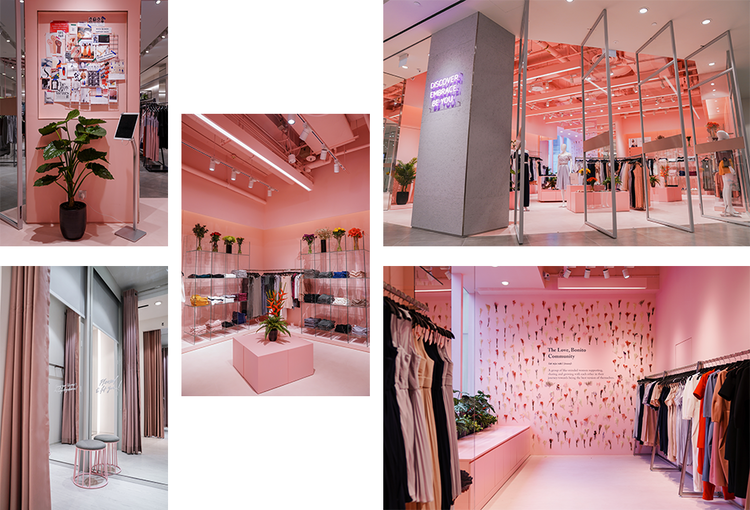 The flagship store holds events like styling workshops, and the store has a feedback wall for customers to leave their thoughts. “It’s a different retail experience, almost like a community meet-up point,” Song says. It’s this kind of transformation that she believes the retail store has to undergo to survive. How can retail stores thrive in the age of e-commerce? The magic phrase in that paragraph is ‘a reason for people to go back.’ But how? Technology has to improve the buying process. Song imagines, for example, a way to save to your account the items you’ve tried in the fitting room. If you shop online later, you can recall what you tried earlier in the store. Song confides that Love, Bonito’s in-house tech team is entirely new. Not too long ago, it was just a team of one! Before we end our interview, we just have to know — where does she get her energy from? Song laughs and attempts an answer.